2008-12-16 Assigned to ACUSHNET COMPANY reassignment ACUSHNET COMPANY ASSIGNMENT OF ASSIGNORS INTEREST (SEE DOCUMENT FOR DETAILS). Assignors: COMEAU, BRIAN, LACY, WILLIAM B., SULLIVAN, MICHAEL J. A golf ball comprising a thermoplastic inner core layer that has a geometric center hardness greater than its surface hardness to define a first “negative” hardness gradient. An outer core layer is disposed about the inner core and is formed from a substantially homogenous thermoset composition, typically rubber, and has an inner surface hardness greater than its outer surface hardness to also define a “negative” hardness gradient. An inner cover layer is disposed about the outer core layer and an outer cover layer is disposed about the inner cover layer. The “negative” hardness gradient of the inner core is typically −1 to −5 Shore C and the “negative” hardness gradient of the core layer is typically at least −7 Shore C. The difference between the inner core surface hardness and the outer core inner surface hardness, Δh, should be at least −3 Shore C.
This application is a continuation-in-part of U.S. patent application Ser. No. 12/196,514, filed Aug. 22, 2008, which is a continuation-in-part of Ser. No. 11/939,635, now U.S. Pat. No. 7,427,242, filed Nov. 14, 2007. The present invention is directed to a golf ball including an inner core layer formed from a thermoplastic material. The inner core layer has a geometric center hardness that is greater than the hardness at its surface to define a first “negative” hardness gradient. An outer core layer is formed around the inner core and is formed from a homogenous thermoset composition, typically rubber-based, and has an inner surface hardness greater than its outer surface hardness to define a “negative” hardness gradient different from the inner core gradient. An inner cover layer is formed around the outer core layer and is surrounded by an outer cover layer. The inner core “negative” hardness gradient is from −1 to −5 Shore C, the outer core layer “negative” hardness gradient is at least −7 Shore C, and a difference between the inner core surface hardness and the outer core inner surface hardness, Δh, is preferably at least −3 Shore C.
In one embodiment, the difference between the inner core surface hardness and the outer core inner surface hardness, Δh, is at least −5 Shore C, more preferably at least −7 Shore C. The inner core center hardness is preferably about 84 Shore C to about 96 Shore C and the inner core surface hardness is preferably about 80 Shore C to about 92 Shore C. The hardness of the inner surface of the outer core layer is preferably about 65 Shore C to about 77 Shore C and the hardness of the outer surface of the outer core layer is preferably about 56 Shore C to about 65 Shore C. The steep “negative” hardness gradient of the outer core layer is preferably at least −10 Shore C.
The present invention is also directed to a golf ball including an inner core layer formed from a thermoplastic material and having a geometric center hardness greater than a surface hardness to define a first negative hardness gradient between −1 Shore C and −5 Shore C. An outer core layer is disposed about the inner core and is formed from a homogenous thermoset composition comprising a diene rubber and having an inner surface hardness greater than an outer surface hardness to define a second negative hardness gradient of at least −7 Shore C. A cover layer is disposed outer core layer and may include an inner cover layer comprising an ionomer and an outer cover layer comprising a castable polyurethane or polyurea material. A difference between the inner core surface hardness and the outer core inner surface hardness, Δh, is preferably at least −5 Shore C.
The present invention is further directed to a golf ball including an inner core layer formed from a thermoplastic material and having a geometric center hardness greater than a surface hardness to define a first negative hardness gradient between −1 Shore C and −5 Shore C. Preferably, the center hardness is about 84 Shore C to about 96 Shore C and the surface hardness being about 80 Shore C to about 92 Shore C. An outer core layer is formed around the inner core and includes a homogenous thermoset composition comprising a diene rubber and having an inner surface hardness greater than an outer surface hardness to define a second negative hardness gradient of at least −7 Shore C, the inner surface being about 65 Shore C to about 77 Shore C and the surface being about 56 Shore C to about 65 Shore C. A cover layer is formed around the outer core layer and may include an inner cover layer comprising an ionomer and an outer cover layer comprising a castable polyurethane or polyurea material. A difference between the inner core surface hardness and the outer core inner surface hardness, Δh, is preferably at least −5 Shore C.
FIG. 1 is a graph showing preferred hardness values and relationships between the “negative” hardness gradient thermoplastic inner core layer and the steep “negative” hardness gradient thermoset outer core layer of the present invention. In a preferred embodiment, the golf balls of the present invention include an inner core layer formed from a thermoplastic (TP) material to define a “negative” hardness gradient and an outer core layer formed from a thermoset (TS) material to define a “negative” hardness gradient. The TP hardness gradient may be created by exposing the cores to a high-energy radiation treatment, such as electron beam or gamma radiation, such as disclosed in U.S. Pat. No. 5,891,973, which is incorporated by reference thereto, or lower energy radiation, such as UV or IR radiation; a solution treatment, such as in a isocyanate, silane, plasticizer, or amine solution, such as suitable amines disclosed in U.S. Pat. No. 4,732,944, which is incorporated by reference thereto; incorporation of additional free radical initiator groups in the TP prior to molding; chemical degradation; and/or chemical modification, to name a few. The magnitude of the “negative” hardness gradient is preferably greater than (more negative) −1 Shore C, more preferably greater than −3 Shore C, and most preferably greater than −5 Shore C. In one specific embodiment, the magnitude of the “negative” hardness gradient is −1 to −5. Other layers of a dual core, preferably the outer core layer, may be formed from a rubber-based composition treated to define a steep “negative” hardness gradient, and preferably the inner core layer is formed from the thermoplastic material of the invention and has a “positive” or preferably “negative” hardness gradient. For example, the inner core may be formed from the ‘hardness gradient’ thermoplastic material of the invention and the outer core layer may include the rubber composition (or vice versa). A base thermoset rubber, which can be blended with other rubbers and polymers, typically includes a natural or synthetic rubber. A preferred base rubber is 1,4-polybutadiene having a cis structure of at least 40%, preferably greater than 80%, and more preferably greater than 90%. Other suitable thermoset rubbers and preferred properties, such as Mooney viscosity, are disclosed in U.S. Pat. No. 7,351,165, filed Mar. 13, 2007, and U.S. Pat. No. 7,458,905, filed Mar. 23, 2007, both of which are incorporated herein by reference. Suitable polyamides for use as an additional polymeric material in compositions within the scope of the present invention also include resins obtained by: (1) polycondensation of (a) a dicarboxylic acid, such as oxalic acid, adipic acid, sebacic acid, terephthalic acid, isophthalic acid, or 1,4-cyclohexanedicarboxylic acid, with (b) a diamine, such as ethylenediamine, tetramethylenediamine, pentamethylenediamine, hexamethylenediamine, or decamethylenediamine, 1,4-cyclohexanediamine, or m-xylylenediamine; (2) a ring-opening polymerization of cyclic lactam, such as ε-caprolactam or Ω-laurolactam; (3) polycondensation of an aminocarboxylic acid, such as 6-aminocaproic acid, 9-aminononanoic acid, 11 -aminoundecanoic acid, or 12-aminododecanoic acid; or (4) copolymerization of a cyclic lactam with a dicarboxylic acid and a diamine. Specific examples of suitable polyamides include NYLON 6, NYLON 66, NYLON 610, NYLON 11, NYLON 12, copolymerized NYLON, NYLON MXD6 (m-xylylene diamine/adipic acid), and NYLON 46. Suitable antioxidants further include, but are not limited to, alkylene trisphenols, such as 2,6-bis(2′-hydroxy-3′-t-butyl-5′-methyl benzyl)-4-methyl phenol; 2,6-bis (2′-hydroxy-3′-t-ethyl-5′-butyl benzyl)-4-methyl phenol; and 2,6-bis(2′-hydroxy-3′-t-butyl-5′-propyl benzyl)-4-methyl phenol. In an alternative embodiment, the antioxidant should be present in an amount to ensure that the hardness gradient of the inventive cores is “negative” and steep. Preferably, about 0.2 phr to about 1 phr antioxidant is added to the core layer (inner core or outer core layer) formulation, more preferably, about 0.3 to about 0.8 phr, and most preferably 0.4 to about 0.7 phr. Preferably, about 0.25 phr to about 1.5 phr of peroxide as calculated at 100% active can be added to the core formulation, more preferably about 0.5 phr to about 1.2 phr, and most preferably about 0.7 phr to about 1.0 phr. The ZDA amount can be varied to suit the desired compression, spin and feel of the resulting golf ball. The cure regime can have a temperature range between from about 290° F. to about 335° F., more preferably about 300° F. to about 325° F., and the stock is held at that temperature for at least about 10 minutes to about 30 minutes. 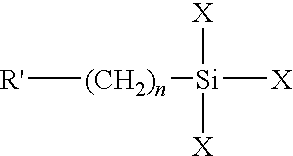 Additional suitable examples of soft and fast agents (that are also believed to be cis-to-trans catalysts) include, but are not limited to, 4,4′-diphenyl disulfide; 4,4′-ditolyl disulfide; 2,2′-benzamido diphenyl disulfide; bis(2-aminophenyl)disulfide; bis(4-aminophenyl)disulfide; bis(3-aminophenyl)disulfide; 2,2′-bis(4-aminonaphthyl)disulfide; 2,2′-bis(3-aminonaphthyl)disulfide; 2,2′-bis(4-aminonaphthyl)disulfide; 2,2′-bis(5-aminonaphthyl)disulfide; 2,2′-bis(6-aminonaphthyl)disulfide; 2,2′-bis(7-aminonaphthyl)disulfide; 2,2′-bis(8-aminonaphthyl)disulfide; 1,1′-bis(2-aminonaphthyl)disulfide; 1,1′-bis(3-aminonaphthyl)disulfide; 1,1′-bis(3-aminonaphthyl)disulfide; 1,1′-bis(4-aminonaphthyl)disulfide; 1,1′-bis(5-aminonaphthyl)disulfide; 1,1′-bis(6-aminonaphthyl)disulfide; 1,1′-bis(7-aminonaphthyl)disulfide; 1,1′-bis(8-aminonaphthyl)disulfide; 1,2′-diamino-1,2′-dithiodinaphthalene; 2,3′-diamino-1,2′-dithiodinaphthalene; bis(4-chlorophenyl)disulfide; bis(2-chlorophenyl)disulfide; bis(3-chlorophenyl)disulfide; bis(4-bromophenyl)disulfide; bis(2-bromophenyl)disulfide; bis(3-bromophenyl)disulfide; bis(4-fluorophenyl)disulfide; bis(4-iodophenyl)disulfide; bis(2,5-dichlorophenyl)disulfide; bis(3,5-dichlorophenyl)disulfide; bis(2,4-dichlorophenyl)disulfide; bis(2,6-dichlorophenyl)disulfide; bis(2,5-dibromophenyl)disulfide; bis(3,5-dibromophenyl)disulfide; bis(2-chloro-5-bromophenyl)disulfide; bis(2,4,6-trichlorophenyl)disulfide; bis(2,3,4,5,6-pentachlorophenyl)disulfide; bis(4-cyanophenyl)disulfide; bis(2-cyanophenyl)disulfide; bis(4-nitrophenyl)disulfide; bis(2-nitrophenyl)disulfide; 2,2′-dithiobenzoic acid ethylester; 2,2′-dithiobenzoic acid methylester; 2,2′-dithiobenzoic acid; 4,4′-dithiobenzoic acid ethylester; bis(4-acetylphenyl)disulfide; bis(2-acetylphenyl)disulfide; bis(4-formylphenyl)disulfide; bis(4-carbamoylphenyl)disulfide; 1,1′-dinaphthyl disulfide; 2,2′-dinaphthyl disulfide; 1,2′-dinaphthyl disulfide; 2,2′-bis(1-chlorodinaphthyl)disulfide; 2,2′-bis(1-bromonaphthyl)disulfide; 1,1′-bis(2-chloronaphthyl)disulfide; 2,2′-bis(1-cyanonaphthyl)disulfide; 2,2′-bis(1-acetylnaphthyl)disulfide; and the like; or a mixture thereof. Preferred organosulfur components include 4,4′-diphenyl disulfide, 4,4′-ditolyl disulfide, or 2,2′-benzamido diphenyl disulfide, or a mixture thereof A more preferred organosulfur component includes 4,4′-ditolyl disulfide. In another embodiment, metal-containing organosulfur components can be used according to the invention. Suitable metal-containing organosulfur components include, but are not limited to, cadmium, copper, lead, and tellurium analogs of diethyldithiocarbamate, diamyldithiocarbamate, and dimethyldithiocarbamate, or mixtures thereof. The soft and fast agent can also include a Group VIA component. Elemental sulfur and polymeric sulfur are commercially available from Elastochem, Inc. of Chardon, Ohio. 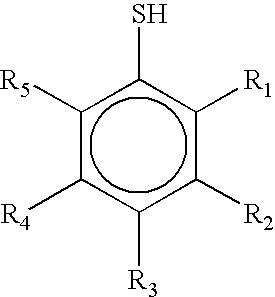 Exemplary sulfur catalyst compounds include PB(RM-S)-80 elemental sulfur and PB(CRST)-65 polymeric sulfur, each of which is available from Elastochem, Inc. An exemplary tellurium catalyst under the tradename TELLOY® and an exemplary selenium catalyst under the tradename VANDEX® are each commercially available from R T Vanderbilt. There are a number of preferred embodiments defined by the present invention, which is preferably a golf ball having a “dual core” including a solid thermoplastic inner core layer having a “negative” hardness gradient and a rubber-based outer core layer having a steep “negative” hardness gradient. wherein the first negative hardness gradient is from −1 to −5 Shore C, the second negative hardness gradient is at least −7 Shore C, and a difference between the inner core surface hardness and the outer core inner surface hardness, Δh, is at least −3 Shore C.
8. The golf ball of claim 1, wherein the hardness of the outer surface of the outer core layer is about 56 Shore C to about 65 Shore C.
9. The golf ball of claim 1, wherein the second negative hardness gradient is at least −10 Shore C.